Pharos Marine Automatic Power is pleased to appoint the DSS Group of Companies including DSS Marine, DSS Marine Lteé, Nord Marine and Fitzwright Survival Inc. as our Exclusive Canadian Agent. The DSS Group of Companies has been supplying Aids to Navigation products for several years now and we are proud to have them as a member of our Global Team. We are confident that the DSS Group will continue to show their high level of customer service and commitment to excellence as they begin work in this new capacity. PHARODECK™ TD/PM Circle & H Lighting System a Success at this year's event. 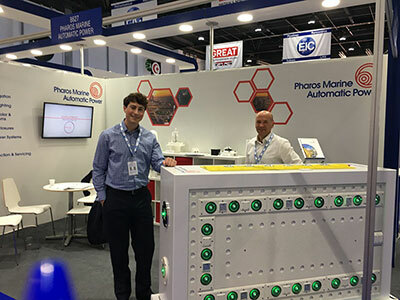 Pharos Marine Automatic Power Ltd. are pleased to announce yet another successful ADIPEC. ADIPEC, now the largest oil and gas conference in the world, has been attended by PMAP Ltd. annually since 2014. On display at this year's conference was our new PHARODECK™ TD/PM Circle and H lighting system as well as our full range of Stainless Steel Navigation Aid Products. An already reputable product and service provider in the Middle East region, PMAP Ltd. are pleased to offer these products in an ongoing effort to expand our scope of value to our customers. Special thanks is due to the EIC and its contractors for once again enabling a seamless, successful show. See you again at ADIPEC, 2018!